PURPOSE: Basiparallel anatomic scanning (BPAS)-MR imaging is a simple MR imaging technique that we designed for visualization of the surface appearance of the vertebrobasilar artery within the cistern. It can clearly show the outer contour of occluded arteries or thrombosed aneurysms. By comparing BPAS-MR imaging with 3D time-of-flight (TOF) MR angiography (MRA), we can precisely evaluate the vertebrobasilar artery condition. The purpose of this study is to determine the value of BPAS-MR imaging for brain MR examination. MATERIALS AND METHODS: We obtained BPAS-MR imaging, in addition to 3D TOF MRA, for 385 consecutive patients who underwent brain MR imaging and MRA in our hospital between April 1 and August 31, 2003. Their complaints varied from mild head symptoms to severe neurologic illness. Comparing BPAS-MR imaging with MRA, we revealed the character of BPAS-MR imaging and determined the role and value of displaying vascular outer contour. RESULTS: Although the cases did not represent a restricted group of vertebrobasilar diseases, BPAS-MR imaging contributed to accurate evaluation of the vertebrobasilar artery in 90 of our 385 patients (23.4%). Of particular note, 16.1% of our patients could not be evaluated accurately by MRA only. 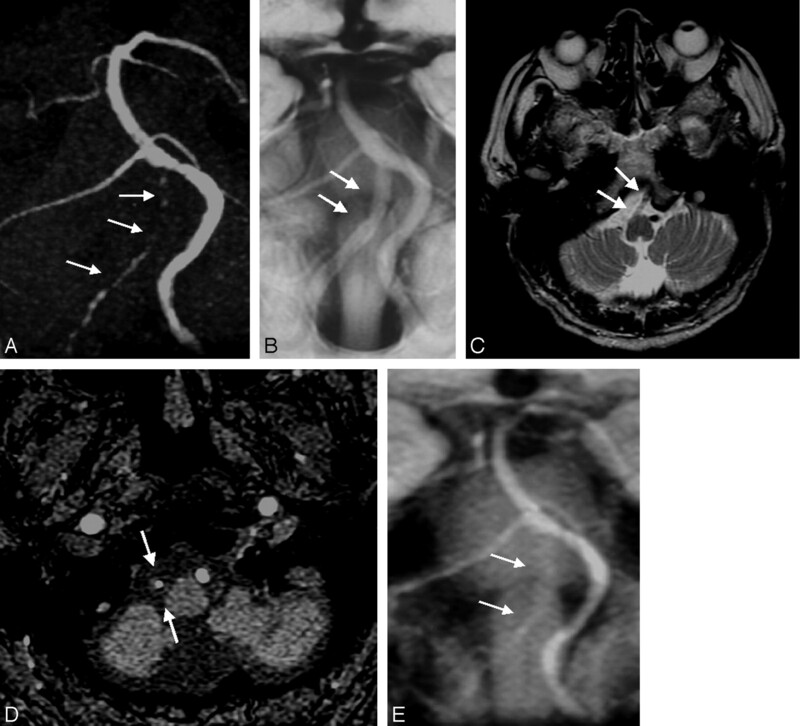 BPAS-MR imaging was useful to confirm hypoplastic or occluded vertebral arteries and to reveal the whole appearance of large or partially thrombosed aneurysms of the vertebrobasilar system. CONCLUSION: The combination of the BPAS-MR imaging and the 3D TOF MRA was necessary for accurate diagnosis in 16.1% of our ordinary patients. We should evaluate not only MRA but also the vascular outer contour revealed on BPAS-MR imaging, though its application is limited to the vertebrobasilar system and the screening use. We modified the surface anatomic scanning (SAS)–MR imaging technique (1) to reveal the surface appearance of the intracranial vertebrobasilar artery. We named our unique MR imaging technique basiparallel anatomic scanning (BPAS)–MR imaging (2). 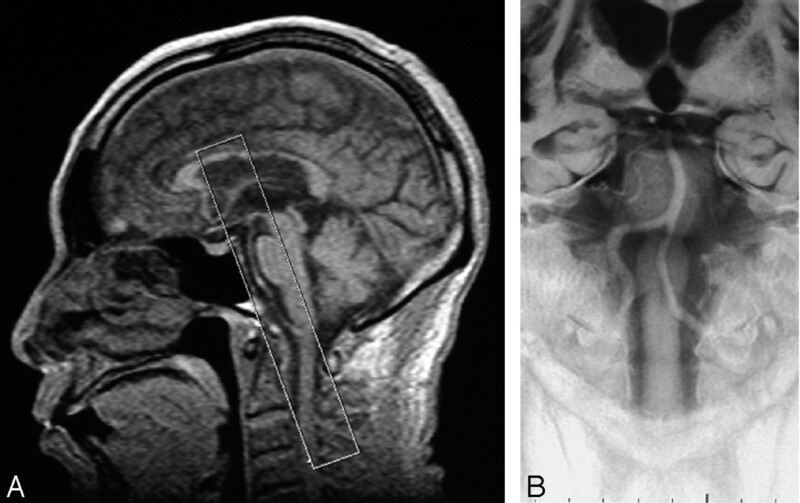 It requires only a 2-cm-thick, heavily T2-weighted coronal imaging, parallel to the clivus, with gray-scale reversal in postprocessing (Fig 1A). An overview of the intracranial vertebrobasilar system is then shown on a single plane (Fig 1B). This technique is so simple that we can obtain BPAS-MR imaging with any MR machine of any company. A midsagittal scout view (A) shows the location of a BPAS scan. White box indicates a thick coronal section posteriorly parallel to the clivus. 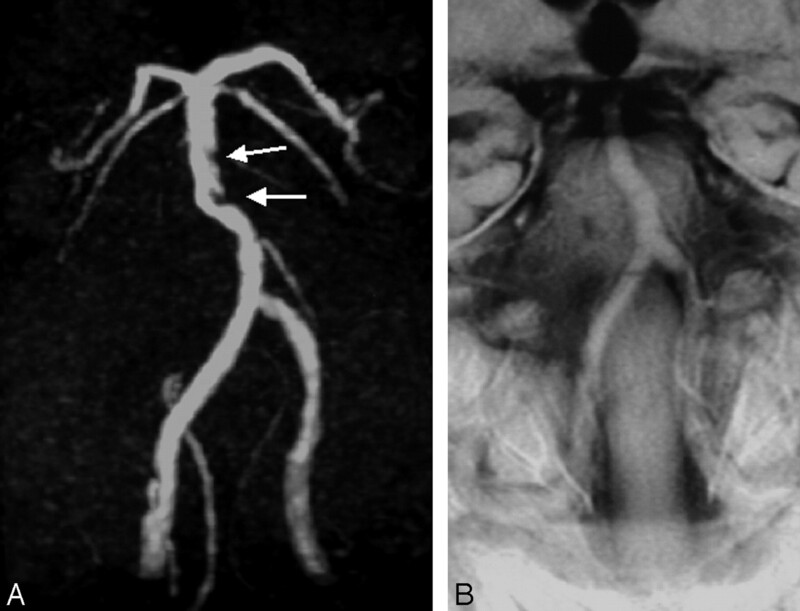 BPAS-MR imaging (B) demonstrates an overview of the vertebrobasilar artery within the cistern. BPAS-MR imaging can easily show the outer contour of the vertebrobasilar artery free from the influence of flow or thrombus. Therefore, the vascular appearance on BPAS-MR imaging is different from what is seen on established imaging modalities, such as MR angiography (MRA) or digital subtraction angiography (DSA), which disclose the inner contour of the vessels. We suppose that the evaluation of vascular outer contour provides more information about the vascular condition. The purpose of this study was to determine the value of BPAS-MR imaging for the brain MR examination. The study was designed with this purpose in mind. We obtained BPAS-MR imaging, in addition to 3D time-of-flight (TOF) MRA, for 385 consecutive patients who underwent brain MR imaging and MRA in our hospital between April 1 and August 31, 2003. The mean age of patients was 61.2 years, with range of 7–96 years (201 men and boys and 184 women and girls). Their complaints were varied from mild head symptoms to severe neurologic illness. Indication for their brain MR examination and the main MR imaging finding of each patient are as follows: 1) for MR examination of the 385 patients, indications were: stroke, 171; headache, 77; vertigo, tinnitus, 43; aneurysm, 27; tumor, 18; syncope, 12; others, 37; 2) MR imaging findings for these patients were: infarction, 204; nothing particular, 117; intracerebral hemorrhage, 19; tumor, 15; aneurysm, 13, vertebral artery dissection, 8; contusion, 5; others, 4. MR imaging was obtained with a 1T unit (SIGNA Horizon LX, GE Medical Systems, Milwaukee, WI). Cranial MRAs were obtained by using a 3D TOF technique. Imaging parameters were 30/10.3 (TR/TE), 20° flip angle, 160 × 160-mm field of view, 256 × 160 matrix, 140-sections with an 1-mm effective thickness that resulted in the coverage of a volume of 70 mm in the craniocaudal direction. BPAS-MR imaging was performed in a 20-mm-thick coronal section parallel to the clivus by using fast spin-echo sequence. The following imaging parameters were used: 6000/250/2 (TR/TE/excitations), 190 × 190 mm field of view, and 384 × 224 matrix. Acquisition time is 1 minute 36 seconds by our pulse sequence. We added only the gray-scale reversal in postprocessing. We could classify the MRA abnormalities of the vertebrobasilar system as follows: (1) irregular or stenotic (Fig 2A), (2) not visible or hardly visible (Figs 3A, 4A, and 5A), and (3) aneurysmal dilation (Fig 6A). We could also classify the BPAS-MR imaging findings of vertebrobasilar system as follows: (1) almost-normal appearance (Figs 2B and 3B), (2) narrow or nonvisualized unilateral vertebral artery (VA; Fig 4B and 5B), and (3) aneurysmal dilation (Fig 6B). Therefore, we could theoretically define the abnormal conditions of vertebrobasilar systems as follows: “atherosclerosis,” “occlusive condition,” “hypoplastic VA,” and “aneurysm,” by combining the findings both on BPAS-MR imaging and on MRA (Table 1). Review of both MRA (anterior projection) and BPAS-MR imaging was performed by consensus interpretation by a neuroradiologist (M.N.) and 2 radiologists (S.O. and Y.A.) who were blinded to the complaints and symptoms of each patient. Neither the spin-echo axial images, source images of the MRA, nor other projections of MRA were available for this interpretation. We then classified the vertebrobasilar abnormalities according to the above classification. A typical case of “atherosclerosis.” MRA (A) reveals irregular defects within the basilar trunk (arrows). Its outer contour on BPAS-MR imaging (B) is relatively smooth, not stenotic. A case of unilateral hypoplastic VA, classified as “hypoplastic VA.” The right VA is not seen clearly on MRA (A, arrows). A small and hypoplastic right VA is confirmed on BPAS-MR imaging (B, arrows). 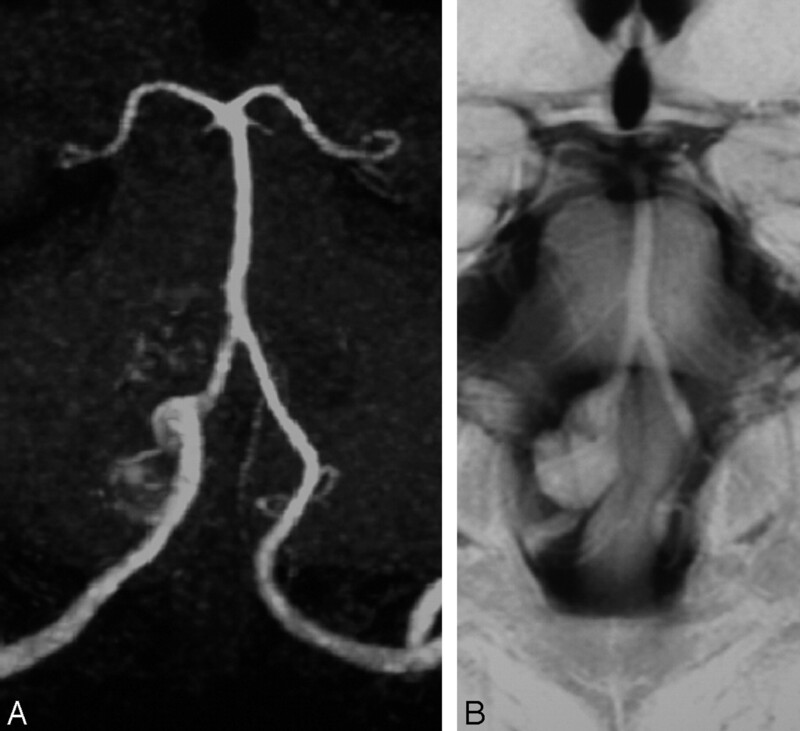 T2-weighted image (C) shows no vascular structure suggesting the right VA.
Another case of “hypoplastic VA.” The right VA terminates in the posterior inferior cerebellar artery (PICA) on both MRA (A, arrows) and BPAS-MR imaging (B, arrows). Note the absence of the distal right VA on BPAS-MR imaging (B). On T2-weighted axial image (C), it is actually difficult to distinguish from the right PICA from the hypoplastic small VA.
A case of right VA aneurysm. The right VA aneurysm on MRA (A) is not clear. Its shape is not equal to what is evident on BPAS-MR imaging (B), perhaps due to partial thrombosis and/or turbulent flow within the aneurysm. Results of the classification of our 385 patients are shown in Table 2. Although they were not a restricted group of vertebrobasilar diseases, BPAS-MR imaging contributed to accurate evaluation of the vertebrobasilar artery in 90 of our 385 patients (23.4%). In these 90 patients, we could diagnose 28 patients with “atherosclerosis” by MRA only. Combination of BPAS-MR imaging and MRA was necessary for more accurate diagnosis in 62 of 385 patients (16.1%). Unilateral VA was not shown on MRA in 56 of 385 patients (14.5%). In these 56 patients, true hypoplasia of the unilateral VA was seen in 26 (6.8% of 385 patients), and occlusion of the unilateral VA of sufficient caliber was evident in 30 (7.8% of 385 patients). Ten aneurysms (including dissecting aneurysms) of the vertebrobasilar system were detected in our series. The shape of aneurysm on MRA was smaller than its outer contour shown on BPAS-MR imaging in 8 patients with large or thrombosed aneurysms. We designed the BPAS-MR imaging technique to be so simple and easy to perform that we can obtain it with any MR imaging machine of any company. Although only one projection image is not sufficient for precise evaluation of vascular disease, coronal projection is the best to survey the entire vertebrobasilar artery. A 20-mm section thickness is usually enough to include the entire intracranial vertebrobasilar artery within the section in almost all cases. A thicker section may be needed for cases with a more tortuous vertebrobasilar artery. Section thickness >20 mm, however, was not available for our MR imaging machine, though 20-mm-thick sections were sufficient for our 385 patients. BPAS-MR imaging is essentially a modified form of MR cisternography. Therefore, it reveals unique outer contour of the vertebrobasilar artery within the cistern. This is the point on which it differs from the established vascular imaging methods such as DSA, 3D TOF MRA, CT angiography, or black blood MRA (3–5), which disclose the vascular inner contour. Although the importance of the evaluation of intracranial arterial wall as a cross-section has been discussed elsewhere (6–11), the usefulness of evaluating the outer vascular appearance has not been reported. Vascular image on BPAS-MR imaging is not influenced by slow flow, turbulence, or thrombus in the inner lumen. In this study, BPAS-MR imaging provided additional information about the vertebrobasilar artery condition in 23.4% of patients. Of particular note, the combination of BPAS-MR imaging and MRA was necessary for more accurate diagnosis in 16.1% of patients, who had conditions such as hypoplastic or occluded VA and large thrombosed aneurysms. Therefore, we think that the combination of BPAS-MR imaging and MRA (anterior projection) is a good screening method for vertebrobasilar disease. It is difficult to make a definitive diagnosis of hypoplasia or occlusion of the unilateral VA on routine MR examination. Occlusion of an artery indicates the presence of some vascular disease—such as thrombosis, embolism, or dissection—even though a patient may have neither symptoms nor past history of stroke. BPAS-MR imaging is useful to avoid missing vascular occlusive disease within the vertebrobasilar system. We think that it is not as important to distinguish severe stenosis from occlusion on MRA as it is that the screening MR examination distinguish the occlusive condition from the hypoplastic artery by BPAS-MR imaging. Some may say that this is possible by evaluating T2-weighted axial images or source images of 3D TOF MRA. In fact, radiologists have acquired the ability to imagine the vascular anatomy from axial spin-echo images (Figs 3C, 4C, and 5C). Others, however, do not always have this skill. Neither the source images of 3D TOF MRA (Fig 3D) nor the reformatted thick-slab coronal image (Fig 3E) clearly shows the outer diameter of occluded VA. We propose that BPAS-MR imaging is more objective and definitive for the differentiation between hypoplastic vessel and occlusive disease. Furthermore, interpretation of BPAS-MR imaging does not require a console. 3D TOF MRA is often unsuitable for visualizing a large aneurysm because of the turbulence within the aneurysm. DSA cannot show the entire contour of the partially thrombosed aneurysm. By contrast, BPAS-MR imaging easily discloses the outer contour of the aneurysm clearly. We conclude that BPAS-MR imaging can provide additional useful information for neurosurgeons about the aneurysm, though the diagnosis of aneurysm may be possible only by 3D TOF MRA. Hypoplastic or absent unilateral VA is not an abnormal condition. It is actually difficult to distinguish accurately the hypoplastic VA from the aplastic VA by BPAS-MR imaging. It surprised us, however, that hypoplasia or aplasia of the unilateral distal VA was confirmed on BPAS-MRI in 6.8% of our 385 patients, whereas it had been reported as 0.2% in the literature (12). Vascular outer contour revealed by BPAS-MR imaging contributed to more accurate evaluation of the vertebrobasilar artery in 23.4% of our ordinary patients. Although its application is limited to the vertebrobasilar system and screening use, neuroradiologists should consider not only MRA but also BPAS-MR imaging. Accepted after revision February 10, 2005.